Towards the middle of 2015 Audi India intends introducing the S5 Sportback, a sportier version of the A5 sportback, in India. The 'S' brand of cars from Audi are middle order performance cars that fall in between their regular sedans and the more hyper performance RS versions. Nonetheless the performance in this car is anything but middling. 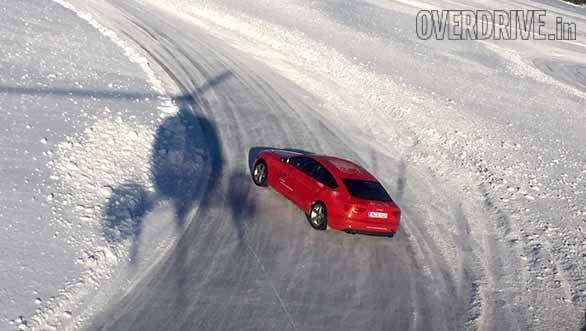 The S5's claim to fame comes from its powerful 3.0-litre V6 TFSi engine, thats a superchargeddirect injection petrol. It delivers a max 333ps of max power and is capable of propelling the car to a claimed 100kmph in 5.1 seconds. This V6 is the most powerful V6 in the Audi range and was earlier seen in the S4. The buzzword here though is efficiency and that's what this V6 engine is expected to do, balance out performance with fuel efficiency. The older S5 got a naturally aspirated V8 and to stay in tune with tighter emission and fuel norms in Europe and elsewhere, the V6 was called to serve. 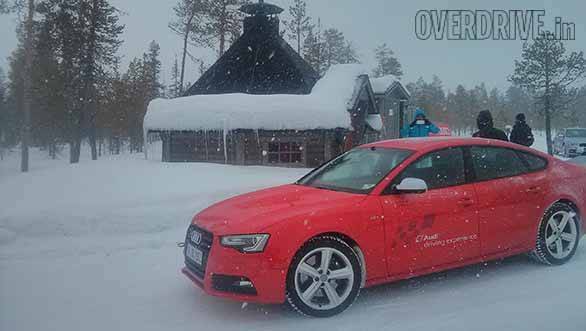 To further aid this efficient nature, the S5 also gets a start stop function. This V6 unit is a refined yet powerful engine. At idle it's like any conventional petrol engine, quiet and smooth. It's more aggressive character only reveals itself once the rev needle gets stretched beyond 3000rpm. Beyond that engine speed you begin to hear the urgency in its voice getting sharper and sharper as the revs climb. It's a healthy sporty note that sounds sweet, goading you to go quicker and quicker to get more of that sweet music. The speed would also come quickly enough if it were not for the conditions I was driving in. So it's a perfectly good car to be driven around in the city but when you'd like to it's the kind of car to take on the holiday up into the hills. Max speed is a claimed 250kmph. This engine is mated to a new 7-speed S-tronic automatic transmission. You have the stick on the transmission tunnel to select between drive modes and paddle shifters behind the steering wheel. Gear changes come up quickly adding to the dynamic abilities of this car. Most of the S5 otherwise remains unchanged from the standard A5 which will also be one of the cars expected to bolster Audi India's portfolio sometime later this year. The chassis for instance employs a similar MacPherson strut at the front with a torsion beam at the rear except its electronically adjustable. So you can select between stiff and soft suspension ratings depending on the driving conditions. The suspension settings can be selected on the infotainment interface with four preset modes and one individual mode that allows you to set various parameters individually. The module thus allows you to change the power delivery using different fuel maps to alter the fueling conditions, transmission, steering inputs and throttle responses. The S5 also gets an optional sports differential that controls the flow of torque between the rear wheels. 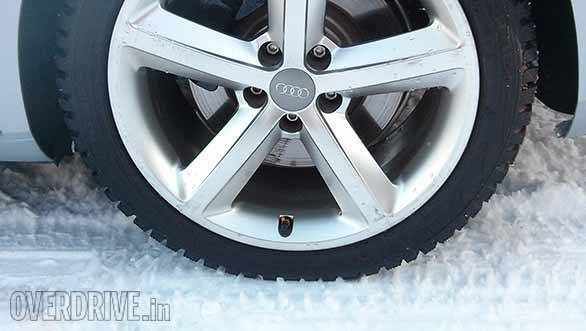 On the frozen lake, this works beautifully providing torque to the wheels that need it making acceleration out of corners a quicker and well balanced affair. The brakes have been improved too with larger discs providing fantastic stopping power though this is an area I still need to test. 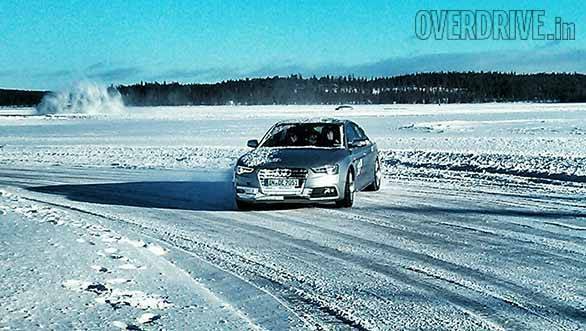 On ice, in the conditions we were in, braking can be very deceptive. The S5 braking system also comes with an energy recuperation system that is used by the alternator to store kinetic energy converted into electric energy in the battery which is used later on by the alternator again. This reduces the load on the engine making it about 3% more fuel efficient. On the cosmetic front there are a few distinctive items that make it stand out from the other cars in the Audi portfolio. Front bumpers side skirts and larger 19" alloy wheels and tyres give it a more dynamic appearance. Then there is the badging all around and a specific grille unique to the 'S' version cars finished with a platinum look. The brake calipers come in red with the S logo stamped on them. And at the rear twin exhausts peek from both sides of the car adding to its dynamic character. Inside the S5 cabin you get sportier seats with better lumbar support. Cosmetically this makes the cabin look more purposeful though I'd love to have seen more accents on the dashboard as well. The only differentiator are the clocks behind the steering wheel which are unique to the s5. It's a spacious car with enough room for five passengers. Adequate boot space and storage bins in cabin complement the family image this car also presents. And then there are a host of creature comforts and features to sweeten the deal. What is optional and what's standard however will be something we will now closer to the time of launch, though Joe King, the present head of Audi India said that S5 would not be lacking for features. So I'd expect it should come fully loaded. 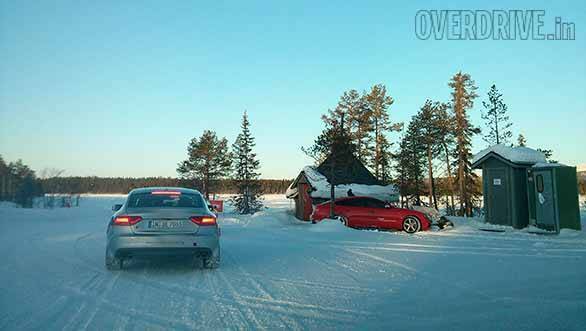 As for positioning expect the S5 to be positioned between the S4 and the RS5 which would make it expensive but after having driven it on ice, I must say this is one of the coolest Audis to come around to India!